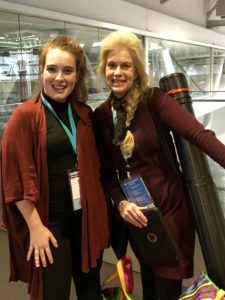 For the first time in over 3 decades of attending the annual meeting of SLPs and Audiologists, I was able to walk to the Convention from my home. What a treat not to have to commute by plane, train and automobile! 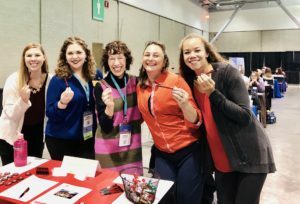 I could not find a Boston logo at the ASHA Convention this year which was disappointing until I realized that meeting up with Northeastern Boston Speechies every ten steps in the Convention Center was way better than any logo. Did anyone else think the ASHA Store sign in the Exhibit Hall looked very similar to the colors and font of the Boston Red Sox? The NU faculty and student presentations were excellent covering everything from pediatric feeding to adult rehabilitation. We are fortunate to be working in a field that allows us to develop our research and clinical expertise in diverse areas. 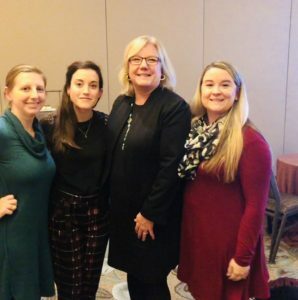 I am always on the look out for updated research on early literacy and was pleased to learn from a number of presenters that we are correct in our context support with oral language scaffolds for early reading development and of course vocabulary, always teach vocabulary. 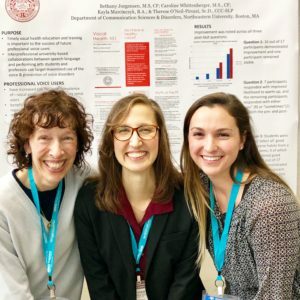 Dr. O’Neil with CSD alum Bethany Jorgensen and Caroline Whittenberger presented on vocal health and hygiene. Dr. Zimmerman pictured with MS SLP first year students working in her Speech and Neurodevelopment Lab. 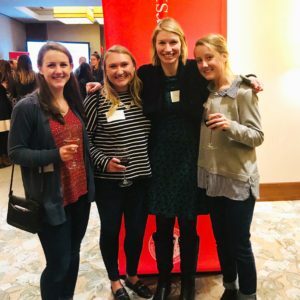 The NU CSD alum get together at the Westin Hotel on Friday evening was well attended by over 130 alum. Dr. Lori Book, Interim Department Chair, welcomed everyone and each of the faculty highlighted their current research. It was awesome to catch up with alum who are all thriving and doing well in the field. Interim Chair, Dr. Book, welcomed everyone to the NU alum get together. Pictured here with alum Meghan Foley, Cassandra Richards and Nicole Blades. The Northeastern Grad Fair Table was well attended by students from all over the United States. Thank you to the faculty and students who helped out at the table. 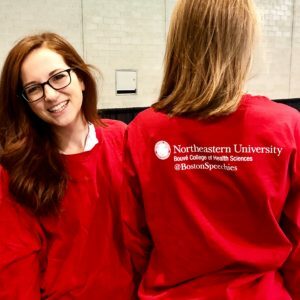 First year MS SLP students Lauryn Armstrong and Billi Aspinwal showed off the great NU CSD swag. 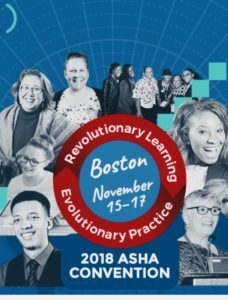 As I reflect on this year’s Convention, I am in agreement with the theme of the meetings: Revolutionary Learning leads to Evolutionary Practice. What more can one say? See you next year in Orlando!